These refreshing summer drink recipes will make deliciously cool beverages, real thirst quenchers for the entire family to enjoy. Generations ago, chilled beverages were well liked in the summer and fall seasons by people of all ages. Healthy beverages were made using favorite seasonal fruits and other all-natural ingredients. If blocks of ice were still available under the sawdust in the old fashioned log ice-house, the drinks were served chilled. You can easily prepare the same non alcoholic drinks that your ancestors once enjoyed. I so enjoy the all-natural mint water made using this refreshing summer drink recipe. So simple to make yet so delicious to drink on a hot day. We have a patch of wild mint growing in a wet area near our house, and we use the leaves to make this refreshing drink. It tastes so good. Mint leaves, chopped, 1/2 cup; tartaric acid, 1 teaspoonful; white sugar, 1/2 cup, or to taste; water, 2 cups. Mix ingredients thoroughly, strain mixture through a cloth and squeeze out any excess juice from pulp, and add water to make 6 cups. Chill. Slice three large pippin apples, and pour over them a pint of boiling water, set in a cool place, when perfectly cold, sweeten it to the taste. Make sure the rose petals are 100% organically grown without the use of pesticides or chemical fertilizers. Red rose petals, 1-1/2 cups; water, 1/2 pint; sugar, 1 cup; whole cloves [to taste]. Put ingredients into a pan and bring to a boil. Cover and simmer for 50 minutes. Cool and strain into clean bottles, and keep cool. Add 2 ounces to a glass of soda water or use in iced tea. One quart of water, tablespoon sifted ginger, three heaping tablespoons sugar, half pint vinegar. Take a handful of either pearl barley, or the common sort, wash it clean, first in cold and afterwards in boiling water, then simmer it in a quart of water for an hour; when half-done, put into it a bit of fresh lemon peel and a little sugar; cool with ice. Rice water may be prepared as above. 6 large teaspoons black currant jam, 1 pint of boiling water. Pour the water over the jam, stir well, and stand until cold. Strain if necessary. 2 lb of lump sugar, 3 quarts water, 1/2 oz citric acid and 1 teaspoon of fresh essence of lemon, 1 oz burnt sugar. Boil sugar and water five minutes, allow it to cool, then add the citric acid, lemon essence, and burnt sugar. Strain and bottle. This drink will keep good for several weeks. The sugar must not be burnt too dark a color. Pound the cherries with the stones to obtain the flavor of the kernel, and press out the juice through a hair sieve, add a little water to it, and give it a boil; then filter it through a flannel bag; [add] some syrup, a little lemon juice and water, to make it palatable, but rich, although not too sweet, which is often the fault with these; ice as wine, and serve. Apricot and peach water made as cherry water. Mash either of these fruits when ripe, and press out the juice through a hair sieve, add a little water to it, and give it a boil; then filter it through a flannel bag, [add] some syrup, a little lemon juice, and water, to make it palatable, but rich, although not too sweet, which is often the fault with these; ice them the same as wine, and serve. Lump sugar, 1 pound; first-class unbleached Jamaica ginger (bruised), 1 ounce; cream of tartar, 3/4 ounce or tartaric acid, 1/2 ounce; 2 or 3 lemons (sliced); boiling water of sufficient quantity. Allow to cool. Put in a tumbler a tablespoonful of current jelly, and a tablespoonful of wine; mix them well together, then fill the glass with ice water. If feverish, leave out the wine. One large ripe pineapple, 1 pint of boiling syrup, juice of 1 lemon. Peel the pineapple, slice, and mash it well in a basin, then pour on the syrup and lemon juice; stir well and cover. Let it stand 2 hours, then filter through a fine silk sieve, and add a quart of spring water. Toast a slice of bread very brown, break it into pieces, and pour over it a cupful of boiling water. When cold and sweetened it becomes a nourishing drink. Take one cupful of ripe, hulled berries; crush with a wooden spoon, mixing with the mass a quarter of a pound of pulverized sugar and half a pint of cold water. Pour the mixture into a fine sieve, rub through and filter till clear; add the strained juice of one lemon and one and a half pints of cold water, mix thoroughly and set in ice chest till wanted. This makes a nice, cool drink on a warm day and is easily made in strawberry season. 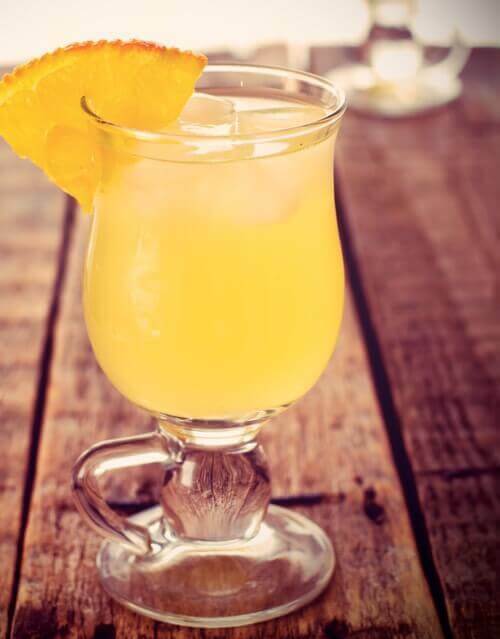 A refreshing summer beverage, which brings an involuntary grace to one's lips as it is quaffed, is a fruit punch in which the pineapple plays an important part. Put into a bowl the juice of three lemons, two oranges sliced and seeded, one grated pineapple and one cup sugar. Let stand for one hour to extract the juice, then press and strain. Add to this juice two quarts of iced water and two slices of shredded pineapple, and serve. These summer beverages were popular in Great Grandma's day and are surprisingly good thirst quenchers. Our forebears didn't have the convenience of a corner store to purchase cold beverages nor did they have the ready cash; they used the simple ingredients they had available to make their own thirst quenchers. Try them and see what you think. Mash a few currants, and pour on them a little water, strain, sweeten, and add sufficient cold water to suit the taste, though it is best to use the currants pretty freely, and sugar, accordingly, as the acid of the currant makes this drink peculiarly grateful to the sick as well as those in health, satisfying the thirst of either. Currant jelly in cold water makes a good substitute for currants, and is next to that of tamarinds, which is undoubtedly the best to allay the thirst of fever patients of anything known. Lemons do very well also. For the field or workshop, nourishing as well as allaying thirst. Make oatmeal into a thin gruel; then add a little salt, and sugar to taste, with a little grated nutmeg, well stirred in while yet warm. This [non-alcoholic drink recipe] was first suggested by the Church of England leaflets put out among the farmers and others to discourage them from carrying whiskey into the field. Remarks. —If the above plan is too much trouble, although it is, indeed, very nourishing and satisfactory, take the Scotch plan of stirring raw oatmeal into the bucket of cold water and stir when dipped up to drink. As near as I could judge, 1/2 to 1 pint was stirred into a common 12-quart pail. Use pasteurized egg products to avoid the risk of egg-related Salmonellosis. Beat the yolk of one egg and a spoonful of white sugar in a bowl to a cream; add a tumbler full of crushed ice — first put the ice in a clean cloth and pound it with a mallet as fine as hail, stir this into the egg; add one spoonful of wine or good brandy and grate a little nutmeg over it; stir this all well. This is refreshing and nutritious as a drink. A small cupful of dried peaches washed carefully; put them into a pint pitcher, and pour on one pint of boiling water; cover tightly, and when quite cold strain.